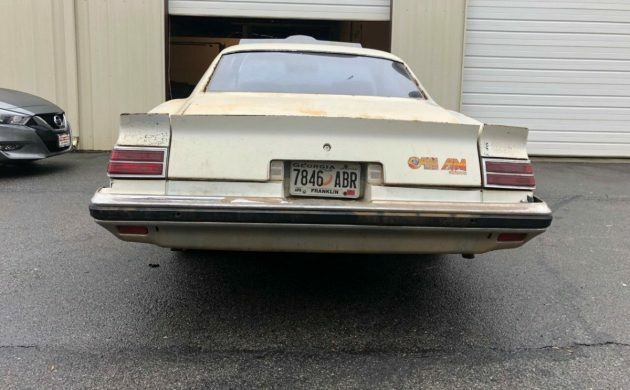 There has always been a level of confusion over the actual number of Pontiac Can Ams that rolled off the production line. The widely held belief that there were 1,377 cars, while Jim Wangers, the man whose company, Motortown, performed the specialist work to fit various components to the cars, has stated that the number was actually 1,133. Regardless of which total is correct, it is a long way short of the originally intended run of 2,500 cars. This Can Am is a sad looking sight, but it does appear to be largely complete and is awaiting restoration. Located in Suwanee, Georgia, it is listed for sale here on eBay. This once stunning looking car is a shadow of its former self, as time has taken a pretty heavy toll on it. The paint is beyond a polish, and a full repaint is going to be the order of the day. There is plenty of surface corrosion around the place, but the only rust that I can see in the admittedly limited photos is a very small amount in the lower quarter panel on the passenger side. The shaker is present but isn’t fitted to the car, and thankfully, the original rear spoiler is still in place. The rear spoiler, or at least its mold, has always been given as the reason why production of the Can Am ended only half-way through the production run. The story is that the mold for the spoiler, which was at Jim Wangers’ Motortown workshop, broke. The decision was then made to end production early rather than source or make a new mold. 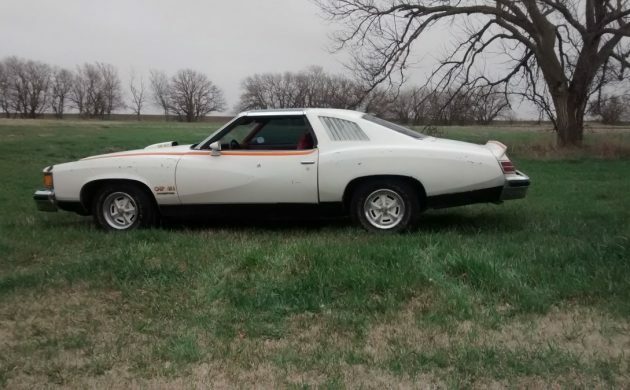 This is a shame because Pontiac was on a real winner with the Can Am. In spite of the intent to only build 2,500 cars, buyers submitted in excess of 5,000 firm orders for the car. Things may not look particularly pretty under the hood, but the news is actually quite good. This is a numbers-matching car, so the original 400ci Pontiac V8 is still there, and is backed by TH400 transmission. The shiny looking carburetor should be taken as an encouraging sign, because this Can Am starts, runs, and drives. The owner says that the engine and transmission work as they should, with no smoke or odd noises. 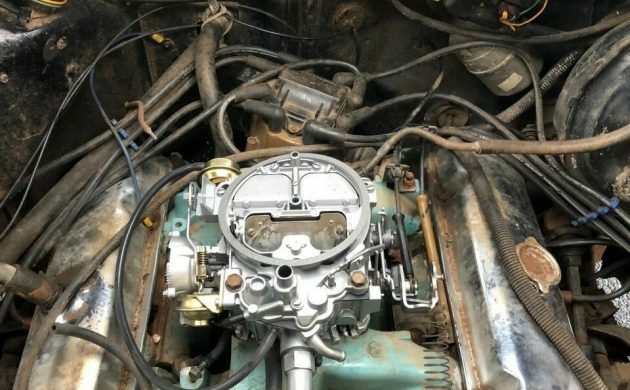 That shiny carburetor is actually the original item which has, in his own words, been remanufactured. The interior is complete, but not all of the components are attached to the car. This is another area that is going to take a lot of work to whip into shape. There really doesn’t appear to be anything in there that has not surrendered to the ravages of time, wear, and UV rays. The good news is that the majority of the trim items are common to the LeMans of the same year, so sourcing parts should be relatively easy. The owner does have a complete dash with harness, and this goes with the car. Bidding on the Can Am has been quite strong, with 20 individuals submitting bids at the time of writing. However, strong bidding doesn’t always equate to high prices, and this car proves that with the price now sitting at $1,825. For me, I’d like to know how things look under the Can Am, as that will have an enormous impact on the cost of restoration. 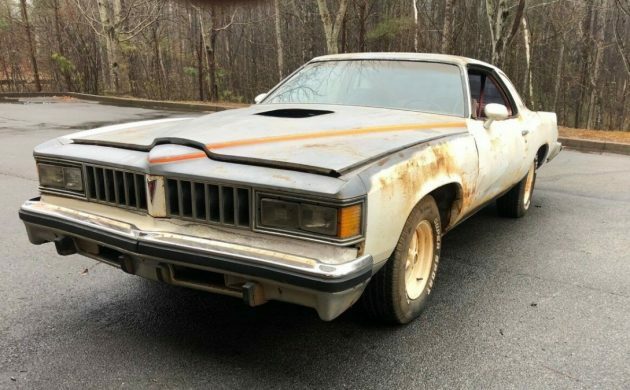 Even if there is rust in the floors, as long as the frame is solid, this is a car that might be worth taking a punt on. For some reason, values on the Can Am stayed really flat until about 12 months ago. They then took a pretty substantial upwards swing, and the prices have remained high. At the start of 2018, it was possible to find an immaculate example for just under $18,000, and there were several examples sold at that time for around that price. Today, a Can Am in similar condition to those that I’ve just mentioned will set you back closer to $27,000. I don’t know why this trend has occurred. Maybe buyers feel that there have been so many Trans Ams hitting the market in recent times that they want something a bit different. The Can Am certainly fits that description. I’ve wanted one of these since I knew what they were. This one can only be brought back by someone who really wants one and can pay for or do the work himself, not someone looking for a Barrett Jackson payday. When these cars are nice they’re desirable. In this condition it’s just another rag. I remember seeing these new as a kid and thinking, what an ugly car. Now after many years I know I was right. To me it’s just another Colonnade coupe with a bunch of tacky add-ons. Rarity does not equal desirability. well, it does seem to be complete, again, need to look at the underbelly. Cheap so far for a runner, if you dig this style. Good Luck to the new owner! Good example of the “beautiful” seat covers avail today – 20 years ago u could get nice red, maroon, blue, etc. velour ones – high or low back buckets in many stores. Now just grey or black. It’s as if the mainstream aftermarket is in cahoots with automakers to prevent old daily drivers from looking nicer & more colorful inside than modern cars, IMO. My Can Am has under 20,000 miles. Since these are not typically restored like as 1977 Trans Am are, everything is impossible to find or stupid expensive. Example, look at the rubber strip on the front bumper. Most all crack right in the center as this car’s has. Mine did also and it has spent its life in a garage out of the sun. That piece of rubber if reproduced these days should cost $125. Mine was so expensive to replace. I once bought a running and driving car for less money. I am also in Kansas. Would like to see your collection. Have any front bumper rubber strips you want to sell! I thought this looked familiar. Plus, no underside pics, paint really fading, no real interior pics. But, for $3k, not bad. Would be alright for the person who really wants one. I just never cared for the body style. Good luck to the new seller and new owner. The economy is too overheated right now, and when that happens, you get people paying 27k for late 1970s cars. We’re due for a correction. Plus, there’s the natural concern of what happens when the Boomers start leaving the hobby in large numbers. Millennials as a whole care little about cars. Some Gen Xers do, but their tastes seem to run towards 1980s and 1990s iron, and they don’t have the numbers to prop up the muscle car hobby as it exists today anyway. I had a ’73 Grand Am 20 years ago or so. I think I ended up “giving it away” for what I had in it–about $5K. I liked the angled, slotted front grille treatment much better than this CanAm boxy grille. Rear end taillights were also much more stylish. Had the rear louvres like this but not the hood treatment or the rear spoiler. Just all -in-all a better looking car. Being a Boomer and owner of 7 classic ’60’s muscle cars, I totally agree with Superdessucke on his assessment, as I have started to ponder what and when I will part with my GTO, SS and early 60’s Corvettes. 73-75 Grand Ams aren’t commanding nearly as much as these Can Ams. Nice examples can be bought for around $15,000. Nice 73 GTO’s can be bought for around $20,000. For some reason people just love the 77 Can Ams. The market is currently correcting itself based on auction results from just one year ago to today. Prices are down and will continue to decline. Good deals are becoming easier to find and more expensive cars are becoming harder to sell. 250 TNT),I wanted to buy one of these to tow them with. Had a chance to buy one for $3500 back in 1998 and passed the deal up. Didn’t have the room for it. I regret not grabbing it even though I likely still wouldn’t own it today. Always liked them though. This one’s more of a Sh-tcan Am. Even if values stay at 27k (by no means a sure bet if the economy turns down), I think you’d exceed that trying to get this one into immaculate condition. If you pay somebody to restore any car other than an LS6 Convertible or a Hemi Cuda you will be upside down in it. If you’re going to pay somebody to restore a car then might as well buy one already done as it’ll cost ya half as much. With that said, this is a very easy restoration. Overall the car looks solid and everything is present. A skilled person could do this car in their garage for $10,000 in parts plus their own labor. Very simple and quick resto for somebody who knows how to turn a wrench. Eh, really? Unless you have a good paint booth in that garage and top flight body and paint skills, I think you’d be close to 10k just getting the body and paint into shape. Just finished up an 18 month frame off nut and bolt restoration on a ’71 C10. Could sell the truck for high 30’s low 40’s easily and it cost me $14,000 plus labor to restore. Custom wood bed, hand stitched 2 tone bench seat, just as clean underneath as it is on top. I could send you some pics of my build if you’d like to pick apart my work but I can assure you ya won’t find any flaws. Cut the roof off of a doner truck to replace mine, did a complete floor, cab corners, rockers. Metal was about $3000. I did major, major rust repair for a few grand so no I do not think that this rust free “Sh-tcan Am” would be $10,000 before it’s in paint. At a restoration shop, sure paying someone a $100 an hour adds up quick, but in my own garage on my own time maybe $1000-$1500 maximum for metal replacement. 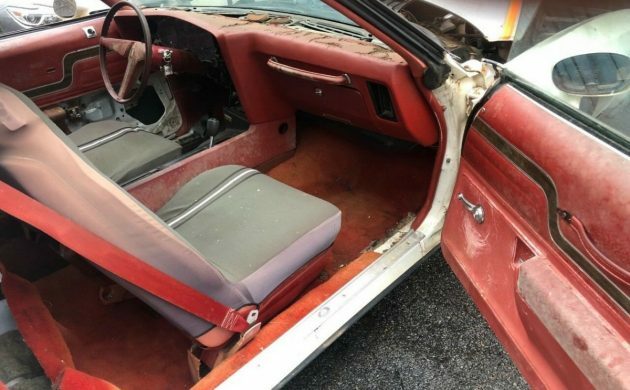 Restoration parts are not what drives the cost of a build up, it’s all the time that it takes for a restoration shop to install said parts at a hefty hourly rate. As for the paint booth, I haven’t installed one yet but my friend owns a body shop and lets me go in there on the weekends and use his booth for a few hundred bucks and a 30 rack. Stop watching Motortrend TV and get your hands dirty. Restoring a car isn’t that expensive if you know what you’re doing. Well, I’ve fixed up my share of cars over the years, and it’s always more expensive than I think it’s going to be. I’ve also learned that a lot of people who restore cars tend to understate their actual cost. My internal car calculator puts this at $30-35k doing most of the work oneself. I think body, paint and engine (including machine work) would eat up about half of that. 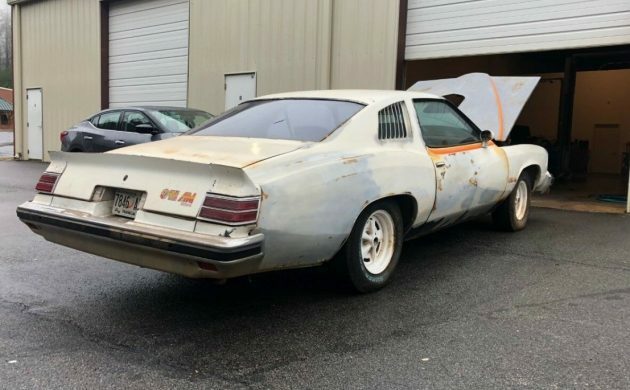 But since you seem to have the gift of restoring things so cheaply, maybe you should take this S***can-Am and restore it, and maybe even post your progress here so we can all see how it’s done! Funny you mention me restoring a “Sh-tcan Am” because I am restoring one in way worse shape right now! Personally, this car is in too good of shape for me to restore. My Can Am doesn’t even have a roof since the previous owner got a little too happy with a sawzall. This Can Am is too nice for me, I’ll leave it for somebody not as skilled. I’m happy with my roofless, Fred Flintstone restoration project for now. That’s cool, seriously. I actually like these cars. I wish you the best of luck with your S***can Am! Let us know your progress. Sounds like you might be able to create the first convertible version! Up top and down below. Too bad the Grand Am nose wasn’t available on this car. Would have made for a more striking vehicle, IMO. Wow the attitudes here remind me of 6th grade. I’d be the guy to resto-mod it…sure, it’d make purists mad- but like this is a better fate? This is what you bought when you were both a little bit Buford T. Justice and a little bit Bandit…….